Give us back our carriages! At the beginning of year, SER abruptly withdrew 2 coaches from 6 heavily loaded peak trains: 07.18, 07.44, 8.04 and 8.29 from Sevenoaks and the 17.41 and 18.28 from Charing Cross. Given the continuing very heavy demand for theses peak morning and evening services, there was no case for reducing the available seating. SRTA pressed SER hard for the immediate reinstatement of these coaches and was supported by e-mails from individual members and publicity in the local press. In response to this campaign, SER has relented (somewhat). The original train lengths have now been restored to the 07.44 and 8.04 and to the 17.41 and 18.28 services. But the shortfall on the 07.18 remains and we will continue to press SER to restore the cut. We have recently been told that with the introduction of a new timetable in December 2009, the length of the 7.29 Cannon Street service will be increased from 10 to 12 carriages. You might ask, however, why such an important peak service was restricted to 10 carriages when Cannon Street is capable of taking 12 carriage trains. A shortage of rolling stock apparently. The SRTA Committee would especially like to thank those individual members who lobbied SER and for their strong backing of the Committee’s efforts. SRTA has long been active in making recommendations to improve commuter and other train services from Sevenoaks. For example, we submitted a paper to the successor to South East Trains, GoVia putting forward detailed proposals for tackling overcrowding. That paper followed up earlier ideas we have put to the previous train operators to improve services. Of most relevance for us are the RUS that are being conducted for South London and Kent. Click here for more information on the Kent RUS and our response to Network Rail’s proposals. The RUS for South London was published in March 2008. The latest timetable took effect from 10 December. It is good news in that the number of trains to and from London overall has increased. However, the morning peak has lost one early service (the 06:31). More trains are now stopping at London Bridge both in the morning and evening. The changes in the number of services each weekday are shown in the table below. The morning peak is defined as trains leaving Sevenoaks after 6:30 and before 9:00. The evening peak is defined as trains leaving London from 16:30 and before 19:30. This definition differs from that of the Passenger’s Charter. Members will be already be aware of some changes in train departure times and the (timetabled!) duration of journeys. It is difficult to summarise the net impact of these but the following charts, which compare scheduled journey times of each weekday service before and after the latest changes, may be helpful. For journeys up to London, there has been a reduction in the number of the faster trains, and evening services are generally somewhat slower. But in most cases the differences are a matter of a couple of minutes. Source: Southeastern Trains. Chart does not include the 00:10 from Charing Cross. This service’ scheduled journey time is 44 minutes, 2 minutes slower than the 00:08 in the previous timetable. Trains from London during the morning peak are somewhat slower, while there are some slightly faster late morning and early afternoon trains. Some evening trains are now slower but the difference is not as marked as trains up to London at this time. The latest alterations in the timetable are relatively minor. We can expect more radical changes with the introduction of fast commuter services from Ashford into St Pancras using the Channel Tunnel line in 2009. The Committee is determined that these changes will not lead to related adjustments to services through Ashford that might be to the disadvantage of Sevenoaks commuters. The timetable is also likely to be affected by the redevelopment of London Bridge and Blackfriars. Again, your Committee is keeping a close eye on this to ensure any disruption is minimised. official responsibility for strategic oversight of the railways. Since 1 April 2006, train services from Sevenoaks have been operated by GoVia, under the nameSoutheastern, through its 100%-owned subsidiary London & South Eastern Railway Limited (LSER). Prior to the re-privatisation of the Kent franchise, between November 2003 and March 2006 the system was operated by South Eastern Trains (‘SET’), a subsidiary of the now defunct Strategic Railway Authority (SRA). This followed the withdrawal of the franchise from ConnexSouth Eastern which had been the TOC for our area following British Rail’s privatisation in 1996. The terms of a TOC’s franchise – in our case GoVia’s ‘Integrated Kent Franchise‘ (IKF), which combines SET’s services with (from 2009) domestic services on the Channel Tunnel Rail Link (‘CTRL’) – are specified and monitored by the Rail Group of the Department for Transport (‘DfT’). Previously, this responsibility was that of the SRA. GoVia’s franchise runs to end-March 2012 with a two-year extension if performance targets are met. The DfT is also responsible for regulating fares. TOC’s typically lease their trains from rolling stock leasing companies (ROSCOs). Currently there are three – owned by Abbey, HSBC, and Royal Bank of Scotland. In June 2006 the DfT made a formal complaint to the ORR alleging that some of the ROSCOs’ activities were distorting competition. This charge is under investigation. Network Rail is owned by members (including representatives from the railway industry, the DfT, public organisations (including Transport for London (TfL) and other associations such as passenger groups and trade unions), and appointed individual members of the general public. Network Rail is regulated by the Office of Rail Regulation (ORR). Since 1 April 2006 the ORR has also had responsibility for the oversight of railway safety, which was previously part of the remit of the Health and Safety Executive. London Travel Watch (officially the London Transport Users Committee) is sponsored and financed by the London Assembly (part of the Greater London Authority) and was established to represent the interests of transport users in and around London. The Rail Passengers Council ( ‘Passenger Focus’) is an independent, government-funded body that represents rail users’ interests at the national level. The reliability and timekeeping of trains are jointly assessed by the ‘Public Performance Measure (‘PPM’). This is measured by the percentage of planned trains that are neither cancelled nor late. A train is ‘cancelled’ if it does not run or fails to complete half of its planned journey. For London and South East area train operators (‘TOCs’), a train is classified as ‘late’ if it arrives at its advertised destination five or more minutes after its scheduled arrival time. As an example, in the three months ending 31 March 2006, South Eastern Trains – just prior to the handover to GoVia – had the following operating results overall. For train operators serving London and the south east, PPM is calculated both for morning and evening peak services combined, and overall. A criticism that could be made of the measure is the understatement of the importance of cancellations. A cancelled train and a train 5 minutes late score the same, although the disruption to passengers created by a cancellation – particularly of a heavily-used service in the rush hour – is likely to be greater. The graph below shows the performance of the Kent franchisees since the measure was introduced in 1997-98. Source: Office of Rail Regulation. Data are for Connex South Eastern until November 2003, South Eastern Trains until March 2006 and Southeastern thereafter. In the chart, quarterly data for performance of peak services and all trains are shown as dotted lines, with the trends (four-quarter moving averages) as a solid lines. The quarterly data show a distinct seasonal pattern with performance falling off sharply in the October to December quarter (‘leaves on the line’ and bad weather). Around 40-45% of delays each year occur in the last quarter. The sharp drop in performance in late 2000 reflects reaction to the Hatfield derailment. However, even before that accident it was evident that overall performance by Connex was deteriorating. Since Hatfield, performance has recovered to roughly its level of eight years ago, although there was a downward blip in the December quarter last year. The recent improvement in performance has been experienced by all the London and South East operators reflecting a recovery in performance by Network Rail. The chart below shows the PPM of the Kent franchise operators relative to all TOCs in the region. Except for a period in 2001-2002, the performance of other London and SE TOCs has been better than that in Kent. Source: Office of Rail Regulation. Responsibility for delays is attributed either to a train operator or to Network Rail according to the cause. In addition, delays arising from poor traction during the autumn leaf fall are allocated to a ‘Neutral Zone’. In the chart below the recovery from Hatfield is apparent in the falling share of delays attributable to Network Rail. Source: London Travel Watch. Data are for years ending March. The most common causes for delay are malfunctions in trains and signalling problems, along with an undefined ‘other’ item attributed to Network Rail. ‘External’ causes are largely attributable to other TOCs using the network. The Thameslink project will involve major re-developments at London Bridge and Blackfriars. SRTA will be monitoring developments closely. In the long run the improvements described below will help to alleviate congestion and improve our services. There will, however, inevitably be some disruption during the construction period which we want to ensure is kept to a minimum. Farringdon station will be lengthened for 12 car trains (this requires the closure of the Moorgate branch). 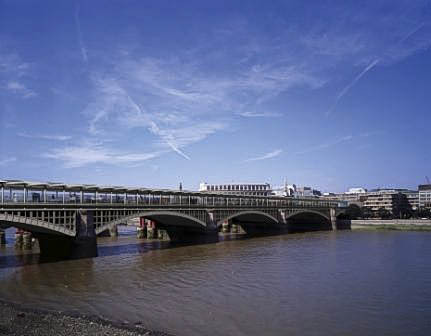 Blackfriars will be rebuilt as a 12-car station across the Thames with access from the both south and north of the river. This involves early closure of the terminal platforms on the east side of the through lines, to enable these lines to be moved to the east, before new terminal platforms can be built on the west of the new position of the through lines. A new viaduct will be built over Borough Market to carry two extra tracks west of London Bridge station. During this time, services currently terminating at Blackfriars and Moorgate will be run as through services between Sevenoaks/ Maidstone East and St. Albans (or further north)..
During 2013-15, London Bridge station will be rebuilt and the rail approaches from New Cross and New Cross Gate will be re-arranged. On completion of this work, services will be run from Ashford via Sevenoaks to Kings Cross and beyond.